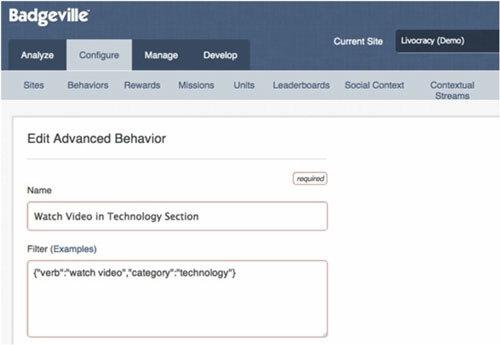 Creating rewards and levels in a gamification program is conceptually simple: You specify the gameplay behavior you want to reward, define any rules associated with the behavior (or behaviors), and then indicate what reward corresponds to that behavior. You’ll also want to associate an image with the reward. There are various types of gameplay rewards: recognition, status, and monetary. These might be further categorized as tangible (monetary) and virtual (recognition and status). If the behavior you want to reward is an advanced behavior rather than a simple one, you can configure various properties as needed. A simple gameplay behavior is one that doesn’t require additional qualifiers to describe. Examples of simple behaviors might include commenting or responding to a customer inquiry. An advanced gameplay behavior is a simple behavior with one or more qualifiers. Advanced behaviors might include commenting on an article about fashion or responding to a customer inquiry within 30 minutes of receiving it. The figure shows the creation of an advanced behavior using a gamification provider’s interface. Some gamification platforms let you copy rules you’ve already created — a real timesaver. Technically, you can redefine levels as necessary. That said, it is recommended that you avoid changing level definitions in such a way that you demote users. It’s more common to add new gamification levels as necessary.